A wire oriented north-south carries current south. The wire is immersed in the Earth’s magnetic field, which is also oriented north-south (with a horizontal component pointing north). The Earth’s magnetic field also has a vertical component pointing down. 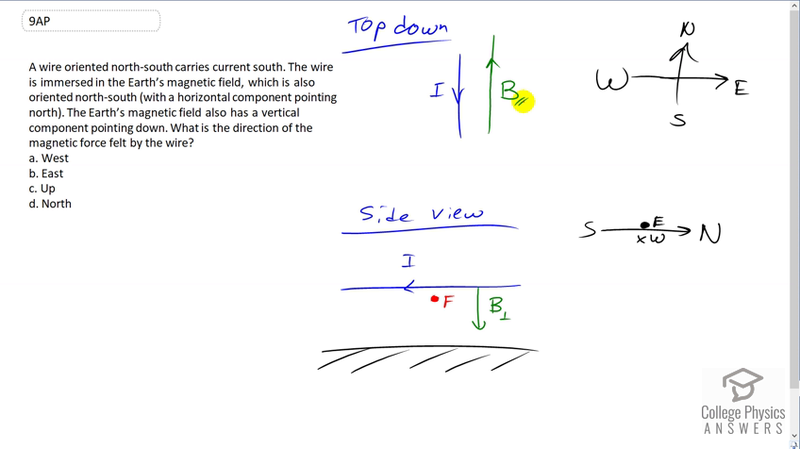 What is the direction of the magnetic force felt by the wire? This is College Physics Answers with Shaun Dychko. The top-down view shows the current in the wire going south and the magnetic field or at least the parallel component of it anyhow, parallel to the ground, is moving to the north because magnetic field lines come out of the geographic South Pole. They go in the geographic North Pole. Now a side view of this picture has the current going this way and that is south. I'm showing east coming towards you, and west going away from you and north is to the right here. This is the ground and where it says we're standing on the ground looking at the wire and there's a perpendicular component of the earth's magnetic field directed towards the ground. So to figure out the directional force that it applies on this current-carrying wire, we put our thumb of our right hand in the direction of the current and our fingers go down towards the ground in the direction of the magnetic field. Then our palm is pointing in the direction of the force which is out of the page and that is to the east. So the answer is B.